At my most recent day job I made sure to always dress like I was an internet cartoonist. Unfortunately for my coworkers, internet cartoonists don’t actually have to wear clothing. 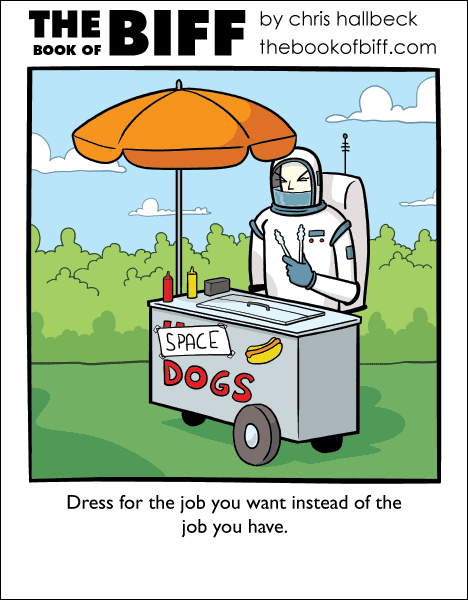 I would definitely buy a hot dog from a vendor dressed like that & with a sign like that. He could totally drive a lot of sales like that. I laughed harder at that then the comic (though the comic was funny, too). I hope he doesn’t get arrested by space cops. Given how injury-prone Biff is, I’m not entirely sure he’ll land the job. What’s with the missing wheel?